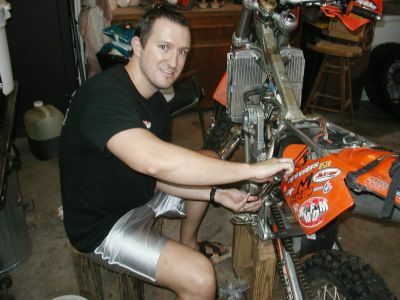 Welcome to “Dirt Bike Dentist.” My name is Michael Nugent and I am a Dentist who was born to ride dirt bikes. My dental office is located in Pasadena, Texas where I focus on General, Implant and Sedation Dentistry. I never had the opportunity to have a dirt bike growing up, but two wheels were in my blood. I received my Bachelor of Science in Zoology with minors in Chemistry and German from Texas Tech University. I moved to Houston to attend The University of Texas at Houston Dental Branch. Several of my classmates in dental school rode dirt bikes, and I decided I was going to get a dirt bike. I bought a Honda XR 650L and quickly found out a dual-sport bike was ok for driving to school but not so good in the forest. I wanted a pure off road dirt bike and purchased a KTM 450 EXC. I instantly fell in love with riding in the Sam Houston National Forest. 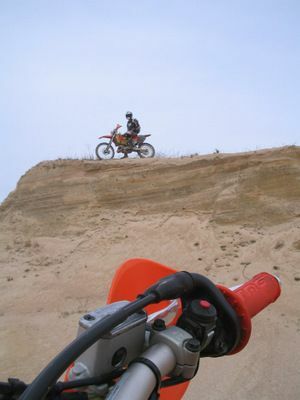 Dirt Bike riding is such an awesome hobby. If you are having a bad week at school or work has you down then GO RIDE! 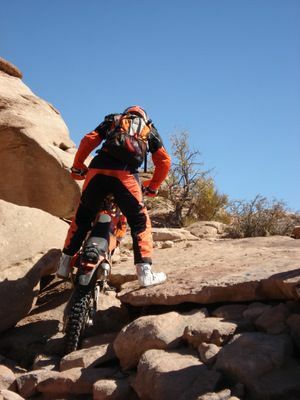 Once you put on that helmet, everything fades away and your sole concentration is on riding. Now, I am no dare-devil or speed demon. It is slow and steady for me. 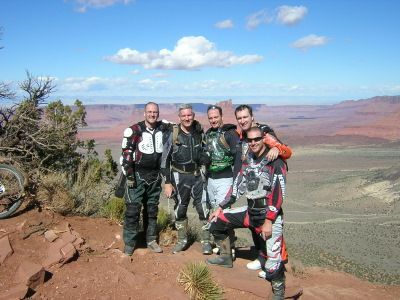 Half the fun of riding is the camaraderie of spending time with your friends. 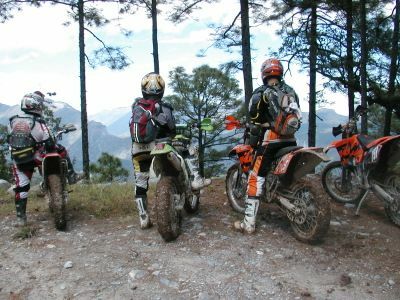 When the weather is nice we ride in the morning, cook out sausages or hamburgers for lunch, relax and then ride in the afternoon. I have had amazing opportunities to ride in Arkansas, Colorado, Mississippi, Nevada, Oklahoma, Tennessee, Texas, Utah and Mexico. It is spectacular to see the wonderful scenery and landscapes. 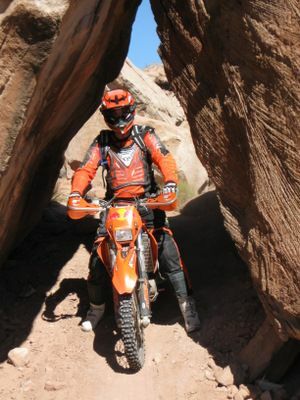 KTM is my dirt bike of choice. KTM is an Austrian bike. 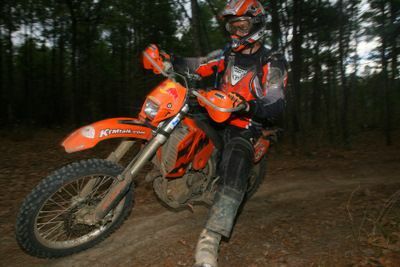 With my KTM 2004 450 EXC, the four stroke motor is amazing and has so much torque. 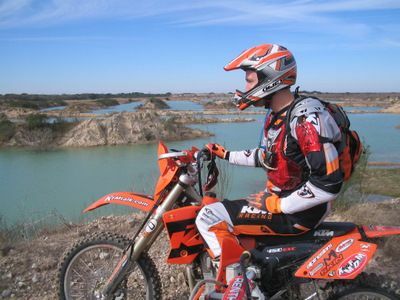 In 2009 I bought my friends 2 stroke dirt bike, a 2006 KTM 300 XCW. 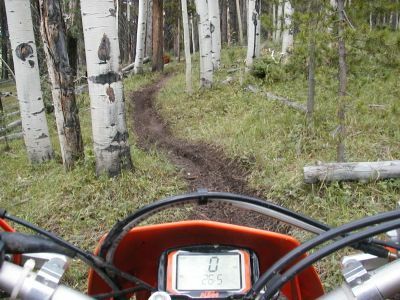 Right now the 2 stroke is my main ride as I love the lighter and more powerful bike. I enjoy working in the garage and “wrenching” on the bikes. 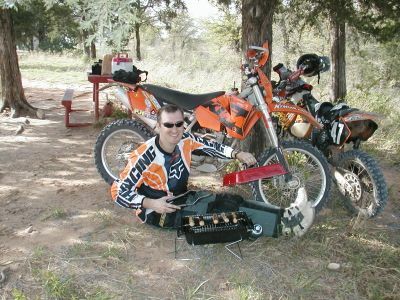 There is always something to do on the bikes as preventive maintenance (just like your teeth) is paramount. It really stinks to break down 30 miles from the truck. For me it is very relaxing and fun working in the garage. When I ride I am always respectful of the environment. My buddies and I stay on the designated trails and never leave trash behind. In fact, if we see trash at the trail head or on the trails, we pick up the garbage. I only ride with all my protective gear. 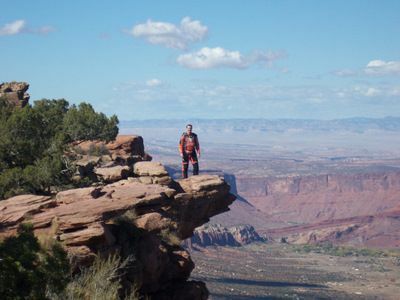 I am a member of the Blue Ribbon Coalition, a nonprofit organization that champions responsible use of public lands and waters for the benefit of all recreationists. Furthermore, I support Americans for Responsible Recreational Access. Life is so much like riding for me…. I do my best to keep my weight centered over the bike and push myself to take on new challenges. When I go down I get back up (asking for help from those close to me if needed), brush off the dust and get right back on the bike. In the next section of trail I make sure to ask myself what it is I can learn from what just happened. All of my life crashes have provided me a lesson. I have had a lot of life (and riding) lessons!! 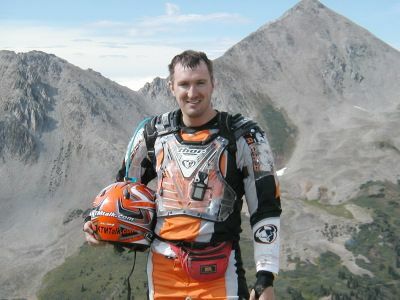 Thanks for looking at my website and allowing me to show you my passion for dirt bikes. If you are looking for a Dentist, I encourage you to look at my main web site www.ThePasadenaTexasDentist.com The main areas I focus on are Cosmetic, General, Implant and Sedation Dentistry. If you need a second dental opinion or just a new dental home, give my office a call at 713-941-8261. We see patients from all the surrounding cities. Patients travel from Alvin, Clearlake, Deer Park, Friendswood, La Porte, Pearland, and even Houston. Our patients value the quality and compassionate care that takes place in a friendly and relaxed atmosphere.